The W NEMA motor range covers products with a wide range of outputs in either 2,4,6 or 8 pole speeds and are available in either aluminium or cast iron construction. The aluminium range covers outputs from as little as 0.166HP to 30HP in frame sizes W-DA56 to W-DA286T, while the cast iron range covers outputs from 0.5HP up to 500HP in frame sizes W-DF143T to W-DF587Z . 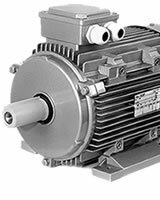 The W NEMA range of electric motors comply with NEMA (National Electrical Manufacturers Association), standards and North American Legislation for energy efficiency including Canada's Energy Efficiency Act. They are also listed as component recognised under file E212054, using UL (Underwriters Laboratories Inc) approved class F insulation system. All Brook Crompton standard W NEMA products for export to North America carry the CSA EEV mark and meet the efficiency levels which have been mandated in the Federal Efficiency Legislation, namely Canada's Energy Efficiency Act and the United States Energy Policy (EPAct). Terminal boxes can be rotated to give four conduit entry positions at 90deg intervals The standard terminal box position when viewed from drive end is terminal box left. 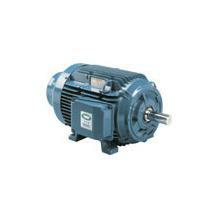 W NEMA motors are supplied with loose leads as standard - a terminal board can be provided on request.